Eli Lynch gets a walking lead at first base for the Blue Lions during a Frontier Athletic Conference game against the McClain Tigers Wednesday, April 11, 2018 at Washington High School. 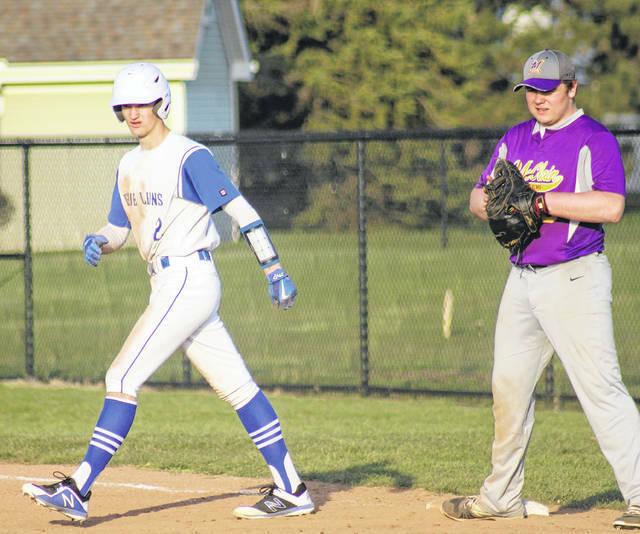 As the temperature rose a bit and the sun shone brightly, the Washington Blue Lions hosted the McClain Tigers in a varsity baseball game in the Frontier Athletic Conference Wednesday evening. The Blue Lions won this game, 10-8. Washington scored one run in the first and one in the second. The Tigers tied the game with two runs in the third. The Blue Lions scored two in the third to take a 4-2 lead. Washington added two runs in the fifth, only to see McClain score six times in the top of the sixth to take an 8-6 lead. The Blue Lions accepted that challenge and rallied for four runs in the bottom of the sixth, scoring all four after two were out. Grant Patterson pitched two innings in relief for the win for Washington. He allowed three hits and two runs (one earned) with three strikeouts and no walks. Nick Barrett started for the Blue Lions and pitched five innings. He allowed six runs (three earned) on six hits. He struck out five and walked two. “Nick pitched well tonight,” Washington head coach Mark Schwartz said. “He deserved to get the win. We had some costly errors, which have been a problem for us all year. Austin Booth started for the Tigers and suffered the loss. He pitched 5.2 innings with eight hits and nine runs (seven earned). He struck out two and walked six. Saylers pitched one-third of an inning for McClain, with one hit and one run (unearned), one walk and one strikeout. The Blue Lions had eight hits, with Tyler Rood, Barrett and Ryan Schwartz each having two. McClain collected nine hits with Anderson, Pollock and Hutchinson each having two hits. For the Blue Lions, Barrett, Schwartz, Eli Ruth and Jarred Hall each hit doubles. Kenny Arboleda had two rbi and Barrett drove in three runs. Saylers and Faulconer both had two rbi for McClain and Pollock drove in three. “It was a good team effort,” McClain head coach Richie Bunner said. “There were a lot of unearned runs today. We probably gave them at least four or five unearned runs. That’s our strength, our defense. “Like I told the kids, I’m not disappointed in how we played and how we fought and how we came back,” Bunner said. “We hit (the ball well). What I’m disappointed in is that we gave them some extra outs. That can’t happen at this level. McClain (3-5 overall, 1-3 in the FAC) is home against East Clinton Thursday and at Hillsboro Friday. Washington (4-1 overall, 3-0 in the FAC) is at Clark Southeastern Thursday and home against Miami Trace Friday. Elsewhere in the FAC Wednesday, Miami Trace defeated Jackson, 7-5 in eight innings and Hillsboro beat Chillicothe, 12-1. Offensively for Washington: George Reno, 0-2, 1 run, 2 bb; Eli Ruth, 1-4, 2 runs, roe, 1 2b; Tyler Rood, 2-2, 2 runs, 2 bb, 1 sb; Kenny Arboleda, 0-3, 2 runs, 2 rbi, 1 bb; Nick Barrett, 2-4, 2 runs, 3 rbi, 1 2b; Austinn Fore, 0-2, hbp; Ross Matthews, 0-0; Ryan Schwartz, 2-4, 1 rbi, 1 2b; Jarred Hall, 1-3, 1 run, 1 sb; Eli Lynch, 0-2, 1 bb; Grant Patterson, 0-0. Offensively for McClain: Anderson, 2-4, 1 run, 1 2b, 1 sb; Banks, 0-3, 2 runs, 1 bb; Saylers, 1-4, 1 run, 2 rbi; Pollock, 2-3, 3 rbi, 1 bb; Whatt, 0-4, 1 run; Booth, 1-2, 1 run; Hutchinson, 2-3, 1 run; Faulconer, 1-4, 2 rbi; Mossbarger, 0-2; Van Dyke, 0-1, 1 run, 1 rbi. https://www.recordherald.com/wp-content/uploads/sites/27/2018/04/web1_Eli-Lynch-WHS-baseball-vs-McClain-4-11-2018.jpgEli Lynch gets a walking lead at first base for the Blue Lions during a Frontier Athletic Conference game against the McClain Tigers Wednesday, April 11, 2018 at Washington High School.